In my day it was about this time of year that us kids would get our first taste of school uniform after taking the 11 plus. We never had uniforms when we were younger. In junior school we wore our ordinary clothes, so moving to senior school was even more of a huge change. Us young lads found ourselves kitted out with long trousers, blazers, ties and caps. So even before we got to continue our education we had to learn how to tie a half Windsor knot. I know children today still have to master this skill, but what they don’t have to do is wear a school cap. They should be thankful because they were a total waste of space. If the school bully didn’t grab it and sling it up on the school bus roof, then wear it in the rain and it was guaranteed to shrink. Actually, I shouldn’t be to disparaging about them because they did inspire our local dentist to invent a ground breaking technique for saving teeth. Let me explain. The first dentist we had in the town was a chap from the Deep South called Dennis E Williams. 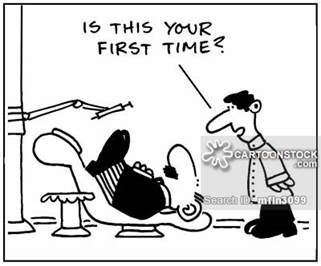 In those days dentistry was a savage occupation of extractions, false teeth and fillings. Until that is, Dennis, peering out of his surgery window spotted us lads climbing aboard the bus. Eureka! He had a brainwave and he wasn’t even in his bath or at the seaside. He could see that the school cap fitted snugly over the young bonce. “What if…” he thought, “you could cover up a decaying tooth the same way?” He set to work and began to experiment with a hollowed out false tooth that he attached to a crumbling blackened molar using a tube of Bostik. It worked! He shared his invention with the world of dentistry and soon, thanks to the school cap the world of pulling teeth was revolutionised. Cavities were sealed for life and smiles saved.